81% businesses use spreadsheets. Like most teams, IT Teams use them too. After all, spreadsheets are really easy to use and can be used by an intern or a CEO. The IT infrastructure of most organisations connects almost all of organisation’s key assets – people, customers, projects, location, software, hardware and finances. It is for this reason that cyber threat can cause such a reputational and financial damage. Intruding IT Network of an organisation is all it takes to get to know the ins and outs of your organisation. Whilst cyber aware organisations have started to use IT Asset Management Software to manage their IT Infrastructure. A significant amount of companies still feel that spreadsheet is built for managing IT Assets and continue to use them. 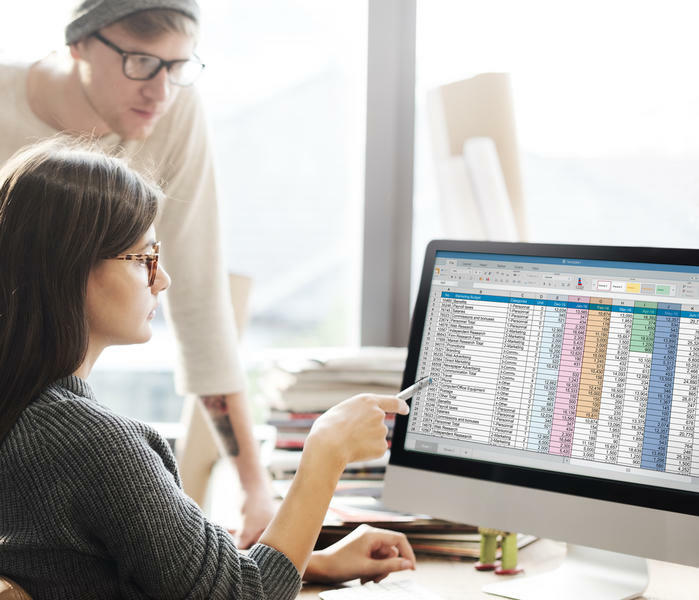 This article explores why good spreadsheets make for bad IT Asset Management strategies. #1. Cost effective to adopt. Spreadsheets are basically free. This is a big factor for many companies, and especially for small businesses that may not have that much of a budget for software acquisitions to begin with. #2. Everybody adapts to spreadsheets. Since practically anyone and everyone know how to use spreadsheets, organizations don’t need to conduct specialized training for personnel who are assigned to perform asset monitoring. Companies also need not worry if the person in charge suddenly resigns from his post; they can just replace him with someone else with minimal instructions. #3. Supports Customisation of Variables and Formulas. Spreadsheets also come with the useful feature of mathematical formula support. Users can just enter the formula in a particular cell and the spreadsheet does the rest. It’s all very easy, efficient, and straightforward. Your hardware and software connects all of your organisation. Right from your CEO to your intern, from your workforce to your customers, from your sales to invoices, from your projects to your technical team – everybody in your organisation is connected via the IT Infrastructure. Your people, customers, projects, sales are all dynamic and fast moving attributes, whereas your spreadsheet is designed to handle static data. 1. Spreadsheets Can’t Readily Keep Track Of Your Workforce changes. Every company will experience workforce changes over time. As the company gets bigger, one can also reasonably expect its employee turnover to rise as well. Using a spreadsheet to keep track of who your current employees are is doable. But using spreadsheets to constantly monitor which particular computers or devices are being used by which particular employees, is next to impossible. Just imagine how frustrating a spreadsheet system would be. When an employee starts working for a company, for example, the spreadsheet has to be updated, with his name recorded into every hardware— laptop, PC, or any type of company-owned mobile device—or software asset assigned to him. When this employee eventually leaves the company in the future, the reverse has to be done. After digging up the trusty old spreadsheet, one must search which hardware or software assets contain his name so that they may be retrieved from the employee before erasing his name from the spreadsheet. This process could turn out to be extremely tedious and cumbersome when applied to every movement in your workforce. With an IT Asset Management software you can create workflows so when an employee leaves all their IT assets are disabled or reassigned to a new employee. 2. Expired Licenses are very difficult to manage with Spreadsheets. For companies that have more than 100 employees, identification of non-compliance via software audits can have significant financial and reputational damage . While a spreadsheet can be used to store the expiry date of a license, it won’t notify the company when that date actually arrives. An IT Asset Management Software, on the other hand, will be able to give notifications that a license is about to expire. This will help companies avoid embarrassing and potentially costly situations where a vendor audit discovers that the company is using software with an expired license. 3. Spreadsheets are not designed for real-time changes. A spreadsheet can be used by a company to record all its IT assets. However, it won’t be able to tell the same company how its software assets have been utilised. The fact is, one can’t really get real-time data from a spreadsheet. It does not know which software asset is deployed at the moment or which asset has been idle for a while. An IT Asset Management Software can help increase their productivity by making sure that assets are utilised to the fullest. This is done by a gauge called Effective License Position (ELP). The ELP tells businesses at a glance whether they are currently over- or under-licensed so that they can quickly remedy the situation. If a company is over licensed, it means that the business is throwing away money by paying for software it is not actually using. If it is under-licensed, on the other hand, it means that the business is facing the risk of penalties and fees should a future software audit discovers that it is using software without sufficient license. 4. Cloud assets are very difficult to manage with spreadsheets. Cloud and SaaS have changed IT applications from server based model to instance-based model. Since spreadsheets are only good for static data, they can’t be adapted to include changes on how businesses record software usage in the cloud. One of these changes that can’t be reflected in a spreadsheet is the use of cloud computing. Some IT assets these days are already in the cloud, a place where spreadsheets just can’t reach and where asset usage is on a per-instance basis. Given the changing parameters of IT assets, the only way for companies to manage their cloud-based assets is to use an IT Asset Management Software. Users of the system can be given different levels of clearance and a role-based access is implemented. Thus, not just anyone can mess with the data, but only those responsible for keeping them as accurate as possible. Yes, notifies expiring & expired software licenses. Helps avoid penalties. No – Once a cell is erased, previous info is gone. Whilst a lot of us think spreadsheet errors do not cause major reputational issues, below are some well known cases of spreadsheets causing major embarrassment. 2012 London Olympic’s 10,000 Non-Existent Tickets. A staff erroneously encoded on a spreadsheet that there are still 20,000 tickets left. Of course, she only meant 10,000 and this resulted with the organisers having oversold by a staggering 10,000. Embarrassing, and costly too since they had to upgrade the sold tickets for other major events. JP Morgan Chase’s $2B Copy-Paste Mistake. London trader Bruno Iksil, also known as the “London Whale” unwittingly caused the banking giant to suffer a massive 2 billion loss in 2012. To make a long story short, it was a copy-paste error which brought down significantly the perceived risks of the assets being traded. As a result, the bank betted big due to the erroneous computation, and lost big as well. Cyber Attacks, Software Asset Management and Employee Training.